A networking and career fair broke out Thursday night, but the wisdom imparted upon future Grand Canyon University graduates went much deeper. 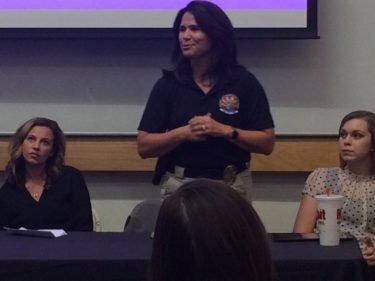 A 12-person panel of GCU alumni from all walks of professional life shared their own career paths and answered questions for nearly two hours in the Antelope Gym lecture hall. Lauri Burgett of the Phoenix Police Department addresses the audience at the “Ask an Alum” event Thursday night. She is flanked by fellow GCU alumni Amanda Lasita (left) and Patricia Greenough. “Ask an Alum” was the first event put together by GCU’s alumni department in collaboration with the newly formed Future Alumni Board (FAB). The latter is a group of GCU seniors attempting to build job and other professional connections between the soon-to-be-graduates and GCU’s rapidly growing alumni base. Liz Conwell, the GCU Alumni manager, said the panel was put together through GCU deans’ recommendations, LinkedIn and the Phoenix Lopes Chapter of alumni. The wide variety of Valley alums’ backgrounds and occupations — marketing, entrepreneurism, finance, health and science, sports, education and law enforcement — made for journeys that often were riveting and thought-provoking for the next generation of graduates. Each of them spoke of their adversities — personally, professionally or both. A lot. Each of them spoke of the times they struggled or failed. A lot. Dr. Nic Markette has combined academia (master’s and doctorate degrees from GCU), business in tech companies and coaching high school soccer, but this all happened years after “doing everything you’re not supposed to do” as a youth. He was married with a child by his high school graduation, which subsequently lost him his education ticket to the Air Force Academy, he was helped by a business from one of his clients who was dying by age 25, had an investment firm at age 30, and after 28 years of marriage lost his first wife to lung cancer even though she was a non-smoker. Patricia Greenough is doing much the same as a special education and math teacher in the Phoenix Union High School District, but doing so first required motivation to get past her own challenges. She is the third generation of her family’s GCU graduates and earned her bachelor’s degree in three years, her master’s degree in one year and will complete her doctorate before age 27. Lauri Burgett began her career in the Phoenix Police Department at age 20. She rose through the ranks for the next 28 years, became the city’s first female Public Information Officer along the way and now oversees more than 75 officers in all walks of law enforcement and its community programs. Sage advice from a dozen GCU sages. The panel also featured other GCU alums: Christina Wagner (director of Arena marketing and sponsorship at GCU); Amanda Lasita (director of development and communications for the Florence Crittenton nonprofit organization); Charles De La Riva (RN at HonorHealth); Austin Walker (group events and hospitality coordinator for the Arizona Diamondbacks); Christopher Borowy (doctor of osteopathic medicine student and instructor at Midwestern University); Stephen Barnes (former GCU basketball game announcer and owner/CIO of Barnes Investment Advisory Inc.); Annalee Ramirez (youth minister and adjunct instructor at GCU).